ON MY WAY OUT tells the love story of our grandparents, who after 60 years of what appeared to be the model marriage, revealed that they had been keeping a huge secret from our entire family. As Holocaust survivors who tragically lost family members, their lives have been filled with darkness. But somehow, their remarkable spirits allowed them to persevere and “succeed” in America. Ultimately, On My Way Out connects with the core values of what makes us human beings, the need and desire to love and be loved. Deeply moved by this complicated love story that highlights the complexities of family, relationships and the impact of secrecy and suppression. This film evoked a variety of emotion, exposed the pain and joy they shared. Above all there was a deep love that bonded them. Beautiful storytelling. A must see for all. Can’t wait to see what this crew does next. Bravo! It is interesting to read some of the other reviews that base the rating on the actual nature of the relationship, not the quality of the story or the content. Clearly it is very triggering for some who view it, and for good reason. This is an incredibly honest and powerful film. The story is one of humanity and crosses gender, sexuality, age, race, etc. If you are human, you can relate to this film on some level. This is a fabulous film with highs, lows, (and even some laughs.) Truly touching. I also recommend seeing "51 Birch Street" that also tackles a family story of this nature. 5 Stars! Horrible. I have a friend who was also lied to this way. This is a documentary about love and honesty, and less about dishonesty. The complicated, heart-breaking, beautiful moments that make up any valuable relationship are captured here and touched me deeply. I know nothing good comes from questioning other reviewers, but someone below stated that there was no need to confess to the family and even insinuated that Noni was somehow bought off with material hush money. To me, in addition to being seemingly cruel and inaccurate, it deeply undermines her anguish and the sacrifices made in order to keep her family and her marriage. Despite Popi's truth, she is unwavering in her love and commitment to him. The prospect of coming to the end of your life and knowing that your family doesn't know your truth is crushing to think about. And it was both of their truths, which gave enormous context and deeper understanding to both of their stories and, in turn, their entire family's understanding of their past. This was a gift. All I really wanted to say is that this is a lovely, loving documentary. 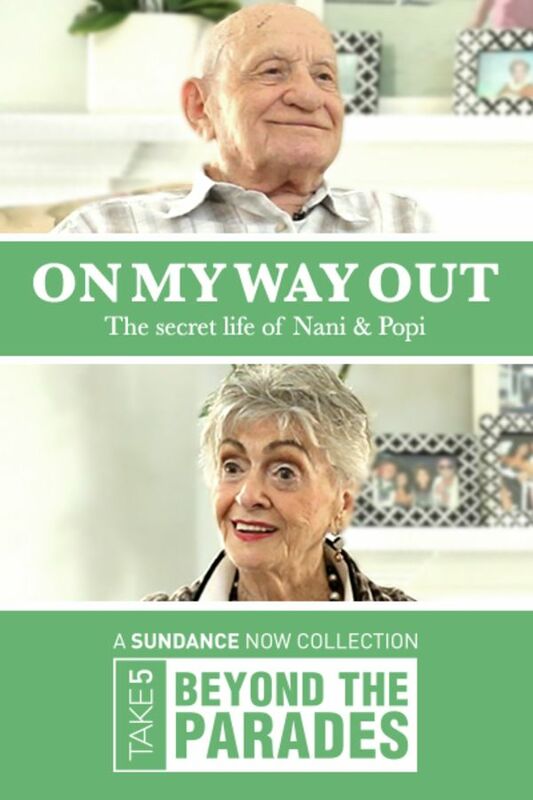 The love between Noni and Popi, the love of their children and grandchildren, the love of the filmmakers for their family and the greater concept that it comes in many different forms. This story was constructed beautifully and inspired a range of emotions and deep reflection about love, family dynamics, and the courage to live authentically. Noni and Papi's intimiate vulnerability, the filmmakers' ability to weave levity and to provoke tons of laughter (through tears), and thoughtful homages to their own family history and tradition throughout this heartfelt piece was simply awesome to experience. This is a film chalk-full of complex protagonists and humanity- I found myself rooting hard for everyone featured in On My Way Out. Must see!